After months of preparation, the day finally came to start my journey to Uganda, Africa to volunteer for S.O.U.L Foundation. I received my vaccines, packed my bags, and obtained my visa, but was I really ready for what Uganda had in store? Although I had been on many volunteer trips before, it was years since my last trip. 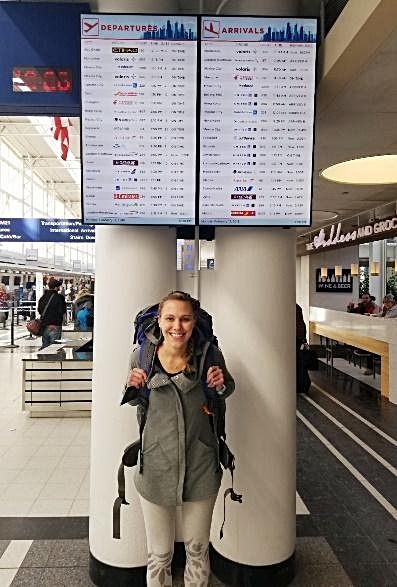 I had never been to Africa, and this time I was traveling by myself! Feelings of nervousness and excitement filled my stomach as I considered what the culture, living situation, and organization would be like. In hopes to gain as much knowledge and life experience as I could from this opportunity, I decided to dive in head first and not look back! Everyone is familiar with the saying, “First impressions can make or break” a situation. When I arrived at the village of Kyabirwa, this statement stood true and their welcome made a lasting impression. The warm smiles and hugs from my host family surrounded me with comfort in a situation that was otherwise full of uncertainty. I was instantly taught common words in the local language to help me feel at home and was greeted with home cooked meals. The people of Kyabirwa were genuinely glad I was there and were eager to make me a part of their family. Being kind, full-hearted, and welcoming is all the people of Kyabirwa know and it is inspiring. It was truly a breath of fresh air. My time there allowed for me to become one with the community. 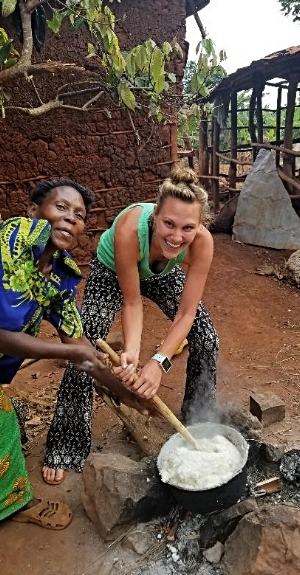 Not only from participating in activities such as harvesting maize, cutting firewood, and cooking local dishes, but to also appreciate the value of true kindness. Because I work as a nurse in the United States, the Maternal Health Program at S.O.U.L. undoubtedly sparked my interest and allowed me to truly explore the topic of maternal health here in Uganda. Prior to coming to Uganda, my observation of maternal health was limited to that of well-developed countries, where resources such as money, materials, and manpower are more readily available. After spending time in this small village community in Uganda and talking to the local residents and health care providers, there were some interesting differences I observed between maternal health care in the USA and Uganda. (Captured further below) The care that both mothers and babies receive before, during, and after birth is vital to the overall well-being and health of those involved. I do want to point out that I do not view either countries' maternal health practices as good or bad, but I am simply stating my own personal observations in order to obtain a good assessment of the overall differences in maternal health in developed versus developing countries. Also, this list does not apply to every pregnancy in the United States or Uganda and to reiterate again, are my own observations and not facts. Some of my findings are based on observing a traditional “home” birthing attendant, while other findings are based on hospital deliveries in Uganda where the birthing process differs significantly. The list I have made is divided into prenatal [before birth], delivery, and postnatal [after birth] care. I have also added information on the ways I believe S.O.U.L. has helped to improve maternal health in Kyabirwa village and up to 30 other nearby villages. Maternal health classes are commonly attended by pregnant women and their husbands. Classes usually teach a variety of topics including breastfeeding, birthing process, and baby care. Classes are typically held by companies or local churches and women often pay to attend the best class. Men often come to maternal health or “lamaze” classes and are present at the bedside during delivery. They even cut the umbilical cord! A lot of time can go into family planning and budgeting for growing members of the family. Parents may even start saving for the child’s college tuition the day they are born or find out they are having a baby. C-section is rare and only performed when needed but a planned date and time is often set weeks ahead of time. There has been a recent transition to home or water births with use of Doulas during labor. Many resources are available to help with education before, during, and after the baby is born including the internet, television, blogs, and social media. Obstacles for women to attend maternal health classes include lack of transportation, distance to classes are too far, number of children within each family household are often larger, thus obtaining child care for the class can be too expensive to afford, lack of adequate advertisement for maternal health class especially in homes and rural areas with no radio, television, or electricity. Some maternal health classes are offered [for men to participate], but it appears to be more focused on the women then the man. I have heard of some budgeting for children, but it is very common to have multiple children, so it can be difficult to pay for them all. There is not too much planning for the future education of the child due to the need to meet basic needs of all the children. Pain medication during birth is less common. Epidural is basically nonexistent form what I have gained from talking to local community members. C-section appears more common but in cases of emergency (baby position, etc.) compared to planning ahead of time. After observing births here, I do feel that the women are more accepting of pain much better than women in the states. Prior to S.O.U.L., there was an apparent lack of maternal health education and desire [from the local community] to come to maternal health classes. S.O.U.L. created maternal health class and offers free Birthing Kits to women who attend the required classes [through the Antenatal Education Center]. S.O.U.L. helps the community understand the importance of having prenatal care and encourages women and men to be educated on all stages of labor. S.O.U.L. maternal health classes discuss the topic of family planning including birth control methods, child spacing, and budgeting for children. Educational resources can be inadequate due to to limited internet and television sources, S.O.U.L. offers local, in-person maternal health classes and has teamed up with local midwives to act as resources for maternal health questions. stay tuned for "off to africa, i go part 2!"